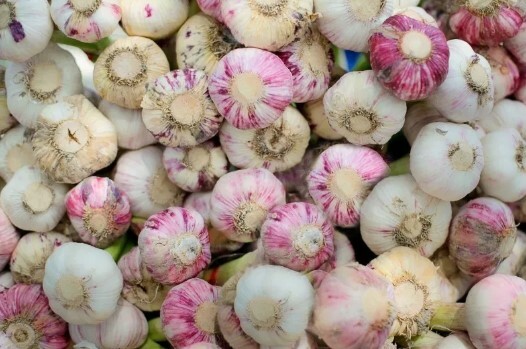 How do you choose which varieties of garlic to purchase? There are so many options…it can be a hard decision. Maybe this little tool will help you pick and place your order. All garlic seed for sale is supplied by our small micro-farm in Elgin Oregon – Greif’s Gourmet Garlic! Below, we have listed some of the characteristics people look for in garlic. Based upon our experience and online documentation about garlic varieties, we’ve tried to classify garlic varieties’ traits to fit these characteristics that people like in their garlic. Please keep in mind that most garlic varieties are good for most common garlic uses! So if a garlic variety does not appear as being strong in a category, it might be that it is just slightly “not quite as perfect” for that use, but would still be wonderful if utilized for that particular purpose. Scan through the characteristics below (green-colored text). Pick the ONE that you think is the most important to you. Click that important characteristic (it is a link). This will take you to a list of garlic varieties that we feel best to meet this characteristic’s description. Write down the names you see under the appropriate heading. Choose the SECOND-most important characteristic to you, and click it. Write down those garlic varieties. If any of the answers from your first and second results match, then that variety might be an excellent one for you. Keep going through additional characteristics in the order of importance to you if you feel a few more traits are urgent. The more times you see a certain garlic variety’s name, the more likely that it could be an excellent one for you! Step 1: Look through these characteristics, below. Pick the most important one, and click it. Step 2: Write down the names of those garlic varieties that are known for matching that characteristic. Step 4: Choose another important characteristic from the list below, and click it. Step 5: Jot down names, and compare to your list from the first group. If any matches are found, circle them…they might be perfect for you! Continue on if you are interested in more traits. Hardneck(s): Music is our favorite, followed by German Red, Fireball, and Spanish Roja. However, all hardnecks make a scape. Softneck(s): All (favorites include Silver Rose, Polish White, Siciliano, Inchelium Red). Consider buying the “average size” garlic, as a huge stalk may not be as pliable.